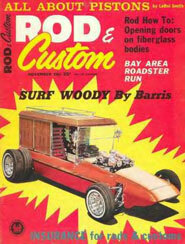 Build a replica of a famous show car from the 60s. Claudia Vasquez and Noa Bruhis build the frame by copying the 1/25th scale model kit. Each tube must be cut and fish mouthed to fit. Along the way we test fit the engine and transmission. We also adapt the frame to accept a Datsun 510 rear axle and control arms. By the way, Noa was voted Homecoming Queen this year. At last a rolling chassis! We've built a custom front end using Mustang parts. We had some help building the upper control arms. We have hooked up a makeshift steering linkage which will be replaced by a rack and pinion unit. We've mounted tires on our Centerline wheels with knock offs... Just like the real car. The chassis with engine and transmission all mounted up and sitting on Go-Jacks ready for body fabrication. Sitting in our brand new build room waiting for funding so that we can buy the materials to fabricate the body.